PA Hebron elects man who murdered six Israelis at prayer 38 years ago. The Israeli Knesset's Deputy Minister of Defense Eli Ben-Dahan called to expand the Jewish Community of Hebron following the election of a convicted terrorist murderer as mayor of the Palestinian Authority controlled side of the city. Tayseer Abu Snieneh of the Fatah party won the mayoral election in the city. He was convicted of planning and participating in an ambush on Jewish worshipers in front of the Beit Hadassah building on May 2, 1980. Groups held Friday evening Shabbat services and kiddush in front of the old Jewish hospital originally built by the age-old Hebron Jewish community in 1893. It served both Jews and Arabs for generations and was one of the first Hadassah hospital buildings in the country until the massacre of 1929. Some of the most brutal killings took place when the mob attacked the Jewish doctor and other people in its lobby. Abu Sneineh, from one of the largest Arab clans in Hebron, was the mastermind behind the 1980 attack. He and three other terrorists threw grenades and shot into the crowd as they prayed. Six people were killed and other twenty injured. The terrorists were caught, arrested, tried and convicted. However Abu Sneineh was released in the Jibril prisoner exchange in 1985. He later was appointed administrator of the Waqf controlled side of the Tomb of Machpela. The move was seen as a stepping stone to his election this year. The vote took place on the anniversary of the terrorist attack. Abu Snieneh boasted of the killings in his election campaign. Hamas has usually won municipal elections in Hebron. Eli Ben-Dahan, in his speech to the Knesset this week, placed the blame squarly on the shoudlers of Mahmoud Abbas (known by his nom de guerre Abu Mazen), president of the Palestinian Authority and head of Fatah, for supporting him. He noted the official Fatah Facebook page and other Fatah outlets, call Abu Sneineh a hero and the attack "brave and courageous." 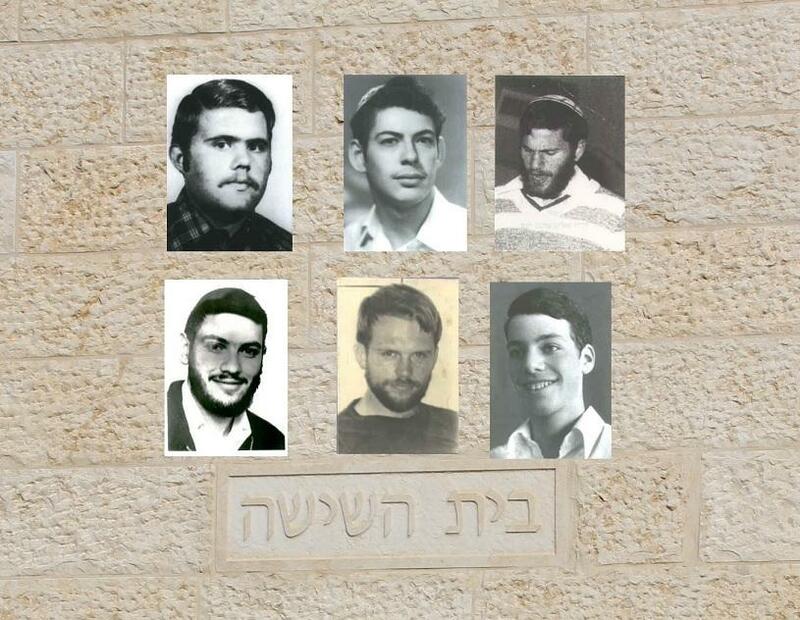 The six students who were murdered were Gershon Klein, Hanan Krauthammer and Yaakov Zimmerman, all of Bnei Brak, Shmuel Mermelstein of Canada, and Zvi "Howie" Glatt, and Eli HaZe'ev of the United States. Zvi Glatt was a Bnei Akiva counselor who moved to Israel. A book of his Torah teachings was posthumously published. Eli HaZe'ev was a winner of a Silver Star for bravery in Vietnam who came to Israel during the Yom Kippur War and converted to Judaism. He left behind a wife and daughter. Ben-Dahan noted that President Donald Trump will be arriving in Israel and will meet with Prime Minister Benyamin Netanyahu as well as PA President Mahmoud Abbas. He asked, "Mr. Trump, are these the bloodstained hands you want to shake? The money the US contributes to the PA is paying salaries to terrorists sitting in Israeli prisons." Ben Dahan concluded by saying the terrorist attack prompted the government of Prime Minister Menachem Begin to finally expand the Jewish Community of Hebron after years of legal hurdles. He called to follow in Begin's footsteps and use the election of the "murder mayor" to expand the community further. To date, there has been stiff opposition to any purchases by Jews of property in the city. Legally purchased apartments have been challenged in court preventing any access. Since 1997, Hebron has been divided into a Palestinian Authority section called H1 which comprises 80% of the city and an Israeli section called H2 which comprises 20%. Of that 20%, Jewish civilians are allowed only within the established Jewish neighborhoods. The Jewish community of Hebron has their own mayor, Avraham Ben-Yosef and an elected board that manages day-to-day municipal issues such as schools, synagogues, garbage pick-up and general maintenance. The H1 section of Hebron is the largest, most populated and wealthiest city in the Palestinian Authority. * Hope and Community Triumph 36 Years after the Murder of "The Six"